It certainly seems to me that the magical alchemy of good made-for-tv horror movies involves one particular equation above all others: accomplishing a lot with very little. Exhibit A: the most memorable horror TV-movies of yesteryear, such as Duel (1971) Don't Be Afraid of the Dark (1973), Trilogy of Terror (1975), and Dark Night of the Scarecrow (1981) create moods of suffocating, overwhelming terror without necessarily showing viewers much by way of monsters, blood or other visual effects. Instead, in each of these productions the audience is strongly encouraged to identify with one "everyman" (or every-woman) character, and then watch as reality seems to slip further away from that protagonist and they descend into situations of the surreal or nightmarish. A salesman experiences supernatural road rage. A woman battles a Zuni Fetish doll come inexplicably to life, and so forth. These stories are models of simplicity and efficiency, but each effort also boasts unexpected high impact due to brawny, virtuoso directorial flourishes. 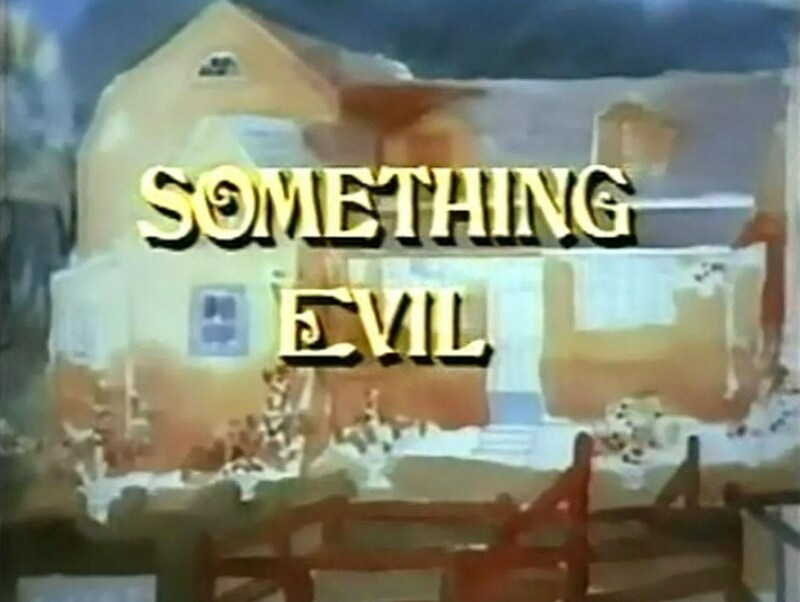 Yet another TV-movie that epitomizes this brand of low-budget ingenuity and inventive spirit is 1972's Something Evil, directed by Steven Spielberg and written by Robert Clouse. This tele-film was made during the rise of Exorcist fever in the United States -- after the book's release and before the premiere of the movie -- and the plot line indeed seems familiar to fans of the Friedkin venture. But the point here isn't necessarily the originality of any specific narrative details. Rather, the point is how ably Spielberg manipulates film grammar to forge an overarching atmosphere of free-floating, amorphous dread. There is something at evil at work in the film all right, but at various times, one might suggest that the "something evil" of the title is madness, family dysfunction, or demonic possession. 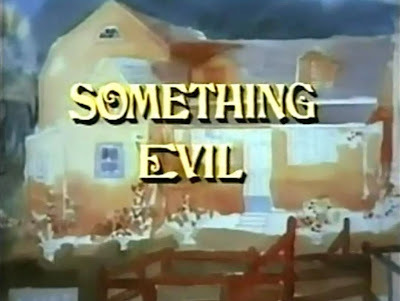 First aired in prime time on CBS in 1972, Something Evil concerns the Worden family as it moves into an old, recently vacated farmhouse in Pennsylvania Dutch country. The patriarch of the family, Paul (Darren McGavin) is a TV ad-man and producer, who is often away in New York City. His wife, Margery (Dennis) is an artist who stays at home and cares for the family's two children, Stevie (Johnny Whitaker) and young Laurie (Debbie and Sandy Lampert). After the Wordens purchase the country home -- which is suspiciously decorated with supernatural pentacles -- Sandy begins to experience regrets about their move. For one thing, a surly neighbor, Gehrmann (Jeff Corey) keeps ritualistically killing chickens in plain view of her bedroom window. For another, Sandy frequently awakens in the night to the terrible sounds of a child crying. Another local, Harry Lincoln (Ralph Bellamy) informs Sandy that pentacles represent a form of protection against devils and demons, and that he himself believes in such devils. In fact, Lincoln has made a study of them his hobby. With Paul away in the city for longer and longer intervals, Sandy grows increasingly paranoid about the house, especially when two of Paul's employees die in a car "accident" after filming a commercial on the premises. Again, the story in Something Evil is one we've all likely seen before. A lonely housewife believes in the supernatural and insists on the supernatural while her "rational" husband refuses to join in and share a meaningful dialogue about it. He's just worried about money. "If we sell this house now, I'd take a terrible loss," he states at one point. On a (very) superficial level, the narrative is similar to Rosemary's Baby, for instance. 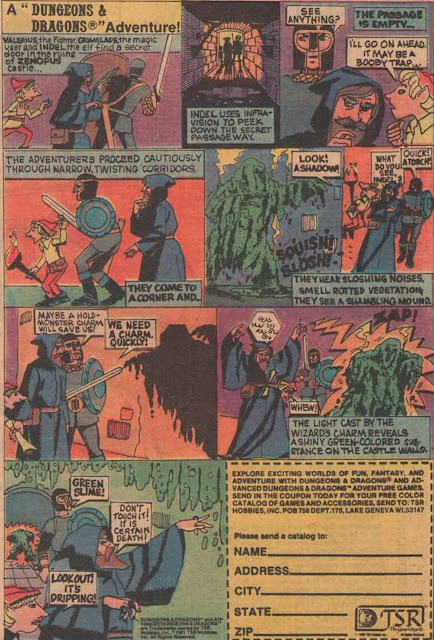 Then, of course, there are the young children imperiled by demonic possession, and local experts warning of a house's dark history with the mystical and supernatural. These plot details suggest The Exorcist, The Haunting and other horror tales we all know and love. Yet Something Evil is perfectly titled. There is indeed "something evil" at work in this horror story, some amorphous aspect of the diabolical, and Spielberg carefully refrains from showing the Evil Thing's presence or even its shape on Earth throughout the film. Rather, the director rigorously crafts unsettling, almost surreal set-pieces that effectively tap into our shared, subconscious language of nightmares. For instance, twice in the tele-film Sandy detects a strange noise in the thick of the night. Both times, the noise sounds like a cat crying at first. Then, as it continues more loudly, we can discern it is the voice of a terrified human child, crying and whimpering incessantly. Sandy follows this unnerving voice down a dark staircase, out into the night, and into an outbuilding, a garden shed. She can find no source for the cries, and returns to bed. The second night that Marge hears the sound, something more terrifying occurs. She follows it to the garden shed a second time, and this time the voice appears to be emanating from a mason's jar filled with a thick red, gelatinous substance. The substance moves in the jar as if it is alive, as if the child's essence or soul is trapped inside. Now, pretty clearly, this doesn't make a lot of "awake" or conscious sense, but it makes perfect nightmare sense. It's irrational and yet wholly terrifying. Amazing what a little food coloring and a mason's jar can achieve when utilized thoughtfully, isn't it? The discovery of the mason jar is just so weird, incongruous and unsettling that you can't quite shake the imagery. To augment the idea of the shed as a source of something unspeakably evil, Spielberg often films his exterior sequences from a vantage point inside the structure, looking out into the surrounding yard. This perspective accomplishes two things of consequence. First, it restricts the available space of the characters visible in the frame. The children are seen playing in the yard, but they are bracketed -- trapped, essentially -- by the arch of the doorway. Secondly, and perhaps even more significantly, this perspective suggests the notion that something is alive in the shed, and gazing out from inside it. This could be the point-of-view shot of a devil or demon. The demonic jar and its contents, perhaps? Another, almost throwaway moment is nearly as unnerving as these canny visual perspectives. Late in the film, Paul is at work in the city, reviewing the commercial footage he shot at his home. A technician enters his office only to show him something weird that inexplicably appears on the film, even on the negative. It's a set of red, glowing eyes...inside one window frame. Again, we're not seeing a CGI demon, or even a man in a costume. We're just seeing a phtographic still of eyes where none should be, and the effect is pretty shocking. Finally, during the climax of Something Evil, Margery must reclaim the soul of her son, Stevie, who has become possessed. Again, Spielberg selects a simple but effective shot to convey the demon's sense of power. He positions the child in the center of the room -- but higher than any child could possibly stand -- and lets all hell break loose around this stationary force, meaning demonic wind, doors swinging open, etc. The child's back is to the camera, so we can't see his face; can;t see what he actually looks like as an instrument of the Devil. Again, when we think of demonic possession we remember the incredible visual effects of The Exorcist: twisted heads and pea soup, namely. With little budget to speak of, Spielberg instead implies the demon's power by positioning him like a pillar -- unmoving --- in the center of the frame; letting others react to his powerful presence. Low-budget filmmakers today really ought to study Spielberg's excellent staging. It's a virtual master's thesis in attaining high impact sans major special effects. Instead, every really chilling moment in Something Evil is achieved through applied film grammar; through positional intimation, to coin a phrase. In narrative terms Something Evil might be interpreted as a story in which a family is torn apart by a sensitive mother's increasing sense of alienation and isolation. Margery physically strikes Stevie at one point, and then delivers a heart-wrenching speech in which she says, essentially, that she is leaving the family (children included), because she no longer trusts herself. She might as well be an alcoholic, given the particulars of her dialogue, and her actions. Conjuring an evil force as the motivation for Mommy's bad behavior seems a perfect metaphor for childhood logic. Mommy isn't herself. There's "something evil" at work inside her. Similarly, Stevie becomes "possessed" by something evil when Mother's love is no longer available. Something else...something of a more sinister shade, steps in to fill that void. Finally, Mom is told that "love is a powerful force" and re-asserts her role in the family. But in some ways, the damage is already done. Though in horror terms, Something Evil offers a pretty hoary, familiar storyline, it succeeds mainly because of Spielberg's staging. 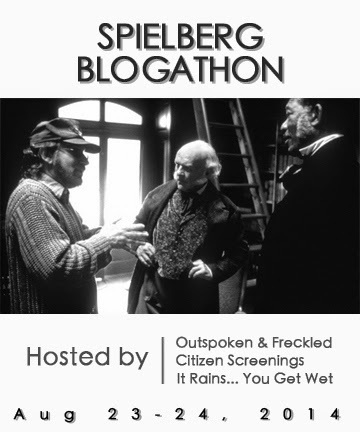 By the time audiences get to Marge's second nocturnal visit to the garden shed -- and the sight of that oozing red gelatin in the mason jar -- Spielberg has us by the throat. Then, the TV movie reaches a fever pitch of terror before ending on another unsettling visual: The family car pulls away from the house of evil, but Stevie -- now free again -- sits backwards in the car, peering towards the camera (and the house), out the back window. If not demonic, Stevie's eyes certainly appear traumatized. His positioning (backwards, essentially, intimating the opposite of order) denies the film a clean restoration of balance and of the natural world, and suggests that Stevie's family problems may just be beginning. In other words, what's encoded here under the supernatural veneer of Something Evil is the idea of how a family's dysfunction damages and destroys children. Something evil happens to the Wordens. Is it demons, or the specter of looming divorce? I often wonder what networks executives were thinking about, green lighting such terrifying tv-movies for family audiences in the 1970s. And then I realize that on paper, Something Evil probably didn't appear too traumatic. Just another, run-of-the-mill demon possession story. But when Steven Spielberg entered the picture, the director lifted the material. He took Something Evil from the realm of the routine and the familiar to the plateau of authentic...well...kinder trauma. And we should really thank him for a job extraordinarily well done. I troll for 70's horror, regardless of the medium, made-for-tv film, episodic tv, theatrical releases, etc. I have truly never heard of 'Something Evil', directed by none other than the master himself. This film is now added on to my troll list. I have never heard of this. Your blog is the best, John!